What really goes on behind the wall that surrounds the United States Naval Academy in Annapolis? What are all those midshipmen, future officers in the U.S. Naval and Marine Corps and leaders of our society, thinking as they stand in neat ranks at the parades beloved by tourists? What are their professors actually educating them to do. 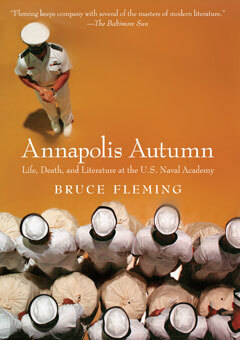 In Annapolis Autumn, Bruce Fleming, professor of English for nearly two decades at the academy and a prizewinning author, captures the sights, sounds, colors, and conversations of this tradition-steeped institution. In other classes, the cadets learn how to assemble guns, control armored vehicles, man battleships, and kill other human beings. Nothing is ever less than “outstanding, sir!” In English class, however, Fleming introduces his students to nuance and subtext, to the gay poets of World War I, and to the idea that not every piece of literature is designed to be “motivational.” Sharing stories from his twenty years at the academy, Fleming explores questions about teaching, the labels “liberal” and “conservative,” and the ultimate purpose of higher education—issues made all the more gripping at a time when many of his students will graduate from the classroom to the battlefield.